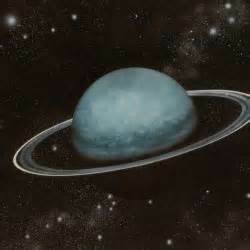 Uranus is the seventh planet from the Sun; it was discovered by William Herschel in 1781. This is significant because around that time the pace of revolutions and rebellions was beginning to speed up. Although humankind was not yet aware of the planet’s existence, obviously it has been there all along. Until fairly recently, its influence has been restricted to our inner planes of consciousness. As inner manifestation must always come before outer, when Uranus was discovered, humankind was ready to receive more of the wisdom of the inner plane; it was waiting to come into expression in the outer world. The pace of both revolution and evolution was speeding up. Uranus spins on its axis from East to West. Thus it moves in the opposite direction to the other planets, except Venus and possibly Pluto. As Uranus is the planet of rebellion, revolution, and ingenuity, spiritually this certainly makes sense. Those who are strongly and positively influenced by its energy can be delightfully different from others. They are the eccentrics of our world, full to the brim with brilliant and original ideas. Those who work on the downside can be rebels without a cause, disruptive and a trial for everyone around. Just like the planet, they need to move in their own deliberate fashion. Which way this shows on the outside, depends on the type of behaviour we choose. Uranus symbolises the Will of God. Imperceptibly and over many lifetimes, it draws us back onto itself, the Source of all being, including ours. Uranus is the liberator. Its energy reflects the sudden and drastic changes that come into everybody’s life at certain times. They are known by some as acts of God, and looked at as if they were something menacing. In truth, they always come for good purpose, namely to set us free from restricting habits, people and places who are no longer beneficial to our spiritual progress. Its effects can be devastating, and the benefits can only ever be seen in retrospect. It seems to me of significance that Venus and Pluto also move in the opposite direction to the other planets. Pluto was the mythological God of the underworld, whereas astrologically he stands for our subconscious. Both planets are symbols of the power of the love aspect of God that is guiding us home through the inner world of our feelings, the subconscious, where we all have a direct connection with our Creator. Venus is the symbol of the loving and harmonising aspect of the Divine. By our own free choices, each one of us will eventually consciously surrender to its energies. We shall do so because we recognise that this is indeed what we have been striving for all along. By that time, we shall have purified our energies so much that we can fully merge with the One again. When one looks at the history of humankind with one’s nose too close to the canvas, it appears as if it had been nothing but one gigantic catalogue of misery, pain and suffering, which we endlessly inflicted upon ourselves and each other. From the higher perspective of life, however, a very different picture emerges and one cannot fail to notice then that – all along – there has been steady progress. And that was the underlying reason why the speed and vehemence of the revolutions that have shaken and swept through our world from time to time, and still do on many different levels of life, have been growing ever more powerful. At the end of this chapter is a link to a video as a poignant reminder of some of the suffering humankind had to endure in recent times. It bears witness to a minute part of lunacies we have been imposing upon each other for a very long time. The ray of hope I am bringing you is the knowledge that the Uranian energies are helping us to shake off ever more of the oppressions and slaveries of all kinds that are the cause of our suffering. Although coercion and cruelty are still rampant in parts of our world, on the inner as well as the outer levels of life, every last bit of it will eventually have been swept away. This is a cleansing process that will continue until the people of all nations will again be able to live in peace and harmony with each other, the way they once did before the lessons of the patriarchy and warmongering began, about six thousand years ago. More about this in a new part of ‘The Random Jottings Of A Stargazer’, hopefully soon. What could be more worthwhile giving of our best and doing our share of ushering in the Aquarian Age, to achieve the freedom that for a very long time has been its promise? However, no human soul can be released from its earthly education until every one of its soul wounds has been healed; every last bit of Karma redeemed and all relationships, especially the most difficult ones, transmuted into bonds of friendship that consist of mutual respect, tolerance, understanding and love; and all false beliefs, prejudices and superstitions have been shed and replaced by our own truth, i.e. what the living God within tells us is true, good and right for us now. As a result of all these demands that are still waiting to be fulfilled by us, individually as well as collectively, one sometimes cannot help a sneaking feeling that earthly life really is a mess. What hope is there for our world when we fail to sort out our own lives, never mind the national and international affairs that are still in need of urgent attention? In either of the above scenarios there is nothing for it but to turn to God and the Angels to ask them to help us work our way through whatever we cannot solve on our own. When we allow the will of the living God within to take over the direction of our lives, It can and will grant us the gifts of patience and tranquillity, to enable us to wait patiently for things to develop in God’s time – not ours – and come right eventually. And if for karmic reasons some particularly trying circumstances still have to be endured by us, our God Self will give us its courage and strength to view every aspect of the experience as our personal crown of thorns. The same as in the Jesus legend, every small earthly self wears this crown when it breathes its last on the cross, humankind’s oldest known symbol for life in physicality. This exit method in the end unfailingly leads each one of us into their own resurrection into the world of light and the fully conscious awareness of our true nature and eternal oneness with God.